How Charter Works - Skytech Inc. Customized service, unmatched comfort and unparalleled convenience are just some of the reasons people choose to travel by a private aircraft. Aircraft Charter allows individuals, groups or companies to utilize a private aircraft on an “as-needed” basis. 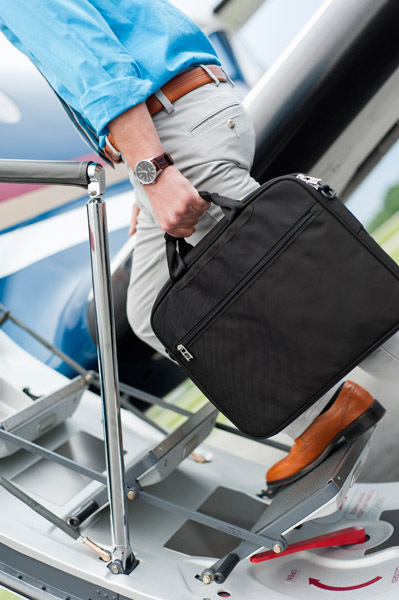 Whether you need to attend an essential meeting with sensitive equipment, fly your entire sales team in a secure and productive setting, or simply want to avoid the aggravations of commercial air travel, you’ll find that chartering a private aircraft is more convenient than you could imagine. And it can save you tremendous amounts of time when compared to alternative modes of transportation. There are plenty of reasons for choosing private aviation. Discovering how they work for you can give you a significant advantage over your competition. Business aircraft are time-saving productivity tools effectively giving your more time in your day. Gain access to over 5,000 General Aviation airports in the United States allowing you to depart and land closer to where you need to be. Fly securely and productively with only those passengers of your choosing. Work en-route, prepare for a meeting, or sit back and relax to arrive fresh. Fly on your schedule – not one set by the airlines. Rest assured that your aircraft and crew meet the stringent safety standards set by the FAA for Part 135 Air Carrier Operators. Business aircraft have a safety record that is comparable to that of the major airlines. If you are new to aircraft charter, welcome! The following is a brief description of how charter works and what to expect throughout the process. To receive a quote from Skytech Travel LLC, simply fill out the form on either our homepage or the Request a Flight main page found here. This form will instantly give you an estimate of what your intended trip will cost and will alert our charter team to build a more complete and detailed quote. This detailed quote will be emailed to you along with our terms and conditions for your review. If you wish to book the trip and secure the airplane, simply sign the terms and conditions page, fill out the associated payment information to hold the flight and return the entire quote to the Charter team via the travel@skytechinc.com email address. All flights are scheduled on a first come, first serve basis and a subject to availability. It’s in your best interest to book a flight as soon as you decide to take it to ensure availability. After booking your trip, a Skytech Charter representative will pass along a Passenger Information Sheet to collect key information about those traveling. This sheet will be used to help us further plan for the flight, establish the lead passenger for contact purposes and determine if any food allergies or special requests are needed. Payment for the charter is due prior to departure and will be based on the quote provided. A credit card can be used to hold and pay for the flight if desired. Alternative forms of payment such as a check or wire transfer are available. Refer to the Terms and Conditions sheet for a complete breakdown. Discounted charter rates are available by purchasing blocks of hours. See the Aircraft Charter page for more information on our discount programs. Your Skytech representative will send you a trip itinerary outlining your trip with departure and destination information. General Aviation aircraft are served at airports by Fixed Base Operators (or FBOs) who handle ramp operations, refueling and passenger and crew needs. These are essentially the terminal for general aviation flights. Some airports have multiple FBOs and your trip sheet with give you the details of which to use for your trip. Plan to show up for your flight about 15-30 minutes prior to the scheduled departure time to account for loading of bags and passengers. Ensure that all passengers have a government issued ID available for domestic flights and passports or other necessary documentation for international travel. Upon arrival, you will be greeted by a member of your flight crew, loaded, and then underway to your destination! Flying on a business aircraft enables you to depart when you want, where you want and arrive closer to where you need to be. This flexibility coupled with the lack of airline connections, security lines, and delays can equate to substantial time savings and reduced stress. While traveling, passengers can maintain productivity by working in a secure and spacious cabin. It’s an extension of the office and allows for passengers to arrive fresh and ready for the task at hand. Take a look at a sample travel comparison for a trip from Owings Mills, MD to Greensboro, NC. For this example, let’s consider there is a 10am meeting that will last until 3pm. The time savings gained by using a business aircraft is substantial. Key employees can arrive to the meeting fresh, prepared for the tasks at hand, and without the stress of airline travel or overnights. After the meeting concludes, they’ll be home in time for dinner!